I personally find it a bit tricky to find deodorants that work. I have the tendency to sweat quickly and a lot so many deorodants just give up at a certain point. 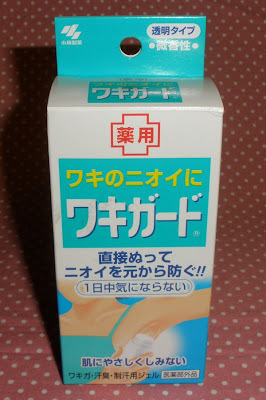 I tried the Kosé Softymo Powder Spray and find it works quite nicely but not for very long times. The Kao 8x4 Kirei sprays on the other hand don´t really work for me. 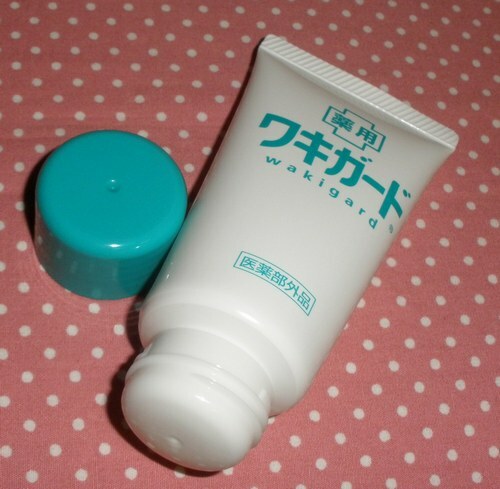 I purchased this Wakigard Deodorant Gel from Kobayashi about 4 months ago and have been using it for about 2 weeks now. 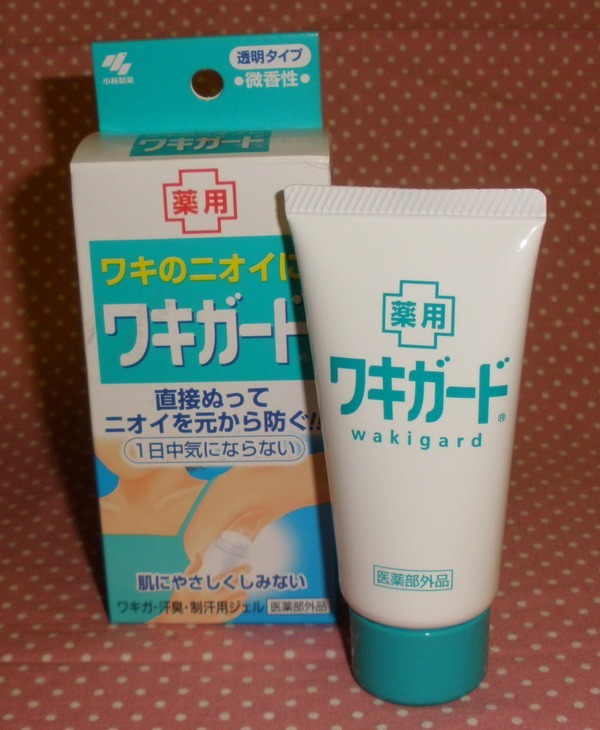 It´s a clear gel that comes in a rather boring 50ml squeeze tube with a hole so you just squeeze some out and apply it to your armpits. The gel dries quickly and doesn´t really have a scent, just smells lightly of menthol thus also feels a little cooling (but really not much, just slightly). Overall very easy and convenient to apply even though I am normally a spray user. I put this deodorant to test through really long, hard and hot days in Austria and here in Egypt and I am seriously impressed with its strength. I don´t smell the least bit of sweat at all even after hours out in the heat. Also my armpits stay dry and clean so this is definitely fantastic stuff for me. After shaving I don´t experience any burning or stinging feeling.. I am not sensitive in that area though! Furthermore there were no stains on my shirts when wearing this! I cannot say if the great effect will persist as I noticed that deodorants sometimes stop working after a certain time (about a month after starting then I should shift to something else then I can go back to the first deodorant). I don´t know what causes this weird thing but it happens to me regularly. So far however this is about the best deodorant I have used in long time and certainly the best I found among Japanese brands so far. Retails for 840 Yen in Japan. I paid about US$10 incl. shipping from Alphabeautyuk on eBay. Hi Kathi! Thanks fo rthis post - I have the same problem too and haven't found anything that works well! Does the gel stain clothing???? Interesting...I don't know about the selection of deodorants in Austria, but have you tried American deodorants? There are some pretty heavy duty ones, including one that used to be prescription only, I believe. no it doesn´t stain as far as I noticed. 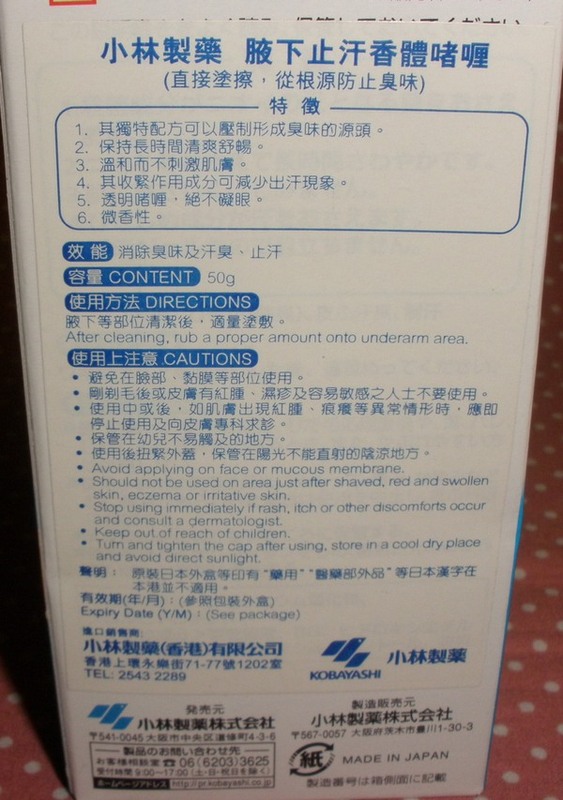 Also I find it mild, doesn´t sting or burn even after shaving my armpits! there are some deodorants in Austria that work like Hydrofugal but the normal stuff like Nivea or Dove don´t work for me. I'll second anonymous and suggest that you try different American deodorants and antiperspirants. I personally sweat quite a bit, and I find that Secret antiperspirant works quite well for me. It seems that Americans have a serious thing about not smelling themselves or anybody else, and apparently we are quite sweaty too *_*;;; If you look at products online, try searching for antiperspirants- those are specifically made to stop sweating. There are many products on the American market promoted specifically to those who sweat more than average that you can buy without prescriptions. Hab es mir geholt und es wirkt recht gut.